Why Biyani Technologies - ACE Library? A unique State of Art is developed which will help Librarian to keep complete track of Books, Periodicals, Journals, Book Bank etc. System is capable of maintaining Multiple registers like for Junior, Senior, University, UGC, etc. Maintain Book Bank, Periodicals, Journals, CD’s, Videos, Tapes etc. Library Management System is divided into different modules so that you can choose as per your requirement, number of books and volume of work. You can add modules as and when required. 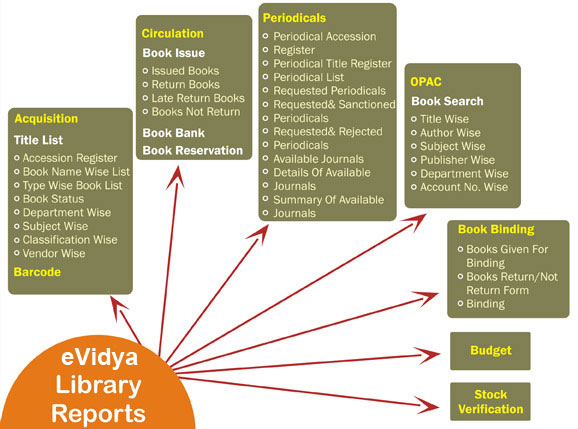 Why Biyani Technologies - ACE Library System? Is build after exhaustive study, discussion and feedback received from many experienced librarians from reputed institutes. Is been developed to include best features of all existing Library Management Software and overcome their drawbacks as reported from users of these existing systems. Has taken special care for making it user friendly, convenience to use, very easy to learn. Single click menus/icons for important and day to day activities like: Issue, Receipt, Accession Register, Data Entry, Due List, Fine Collection etc. Is integrated with all modern functionalities and accessories like Bar Code, RFID tags etc. Has unique facility for automatic importing/migration of your existing data in this system. Is ideal not only for traditional printed books but ideal for handling today's digital media like: CD's. DVD's, Audio Cassette, Video Tapes etc. Multi User, Multi System, Multi Lingual and Online Access Feature. IS THE SOFTWARE WHICH EVERY LIBRARIAN & PRINCIPAL HAS THOUGHT ABOUT. It is his own software, build by his own people, using his own suggestions and feedbacks. Does the software cover all the requirements of our Library, integrate with latest accessories like Bar Code, RFID tags ? Will it be suitable for today's eMedia and Digital copies ? We have waited for long. Really if this software is the best ? What about all those data that has been already been fed into the system ? Will the company provide quality services and update the software time to time to suite our requirements ? Is any other college or school using this software and what is their feedback ? Existing users: Confusion whether to stay and unwillingly continue with their existing system which does not cover all requirements ? Is it expensive or fit into our budget?